The Greek island of Ikaria. What's the secret to longevity? A recent study suggests one answer might be a daily cup of very strong Greek coffee. The study published in Vascular Medicine focused on elderly residents from the Greek island Ikaria between the ages of 66 to 91 and found that those who drank boiled Greek coffee at least once a day (rather than just the filtered coffee popular in America) tended to have improved endothelial function, meaning they had the better functioning cells that lined their blood vessels, which could mean better cardiovascular health. 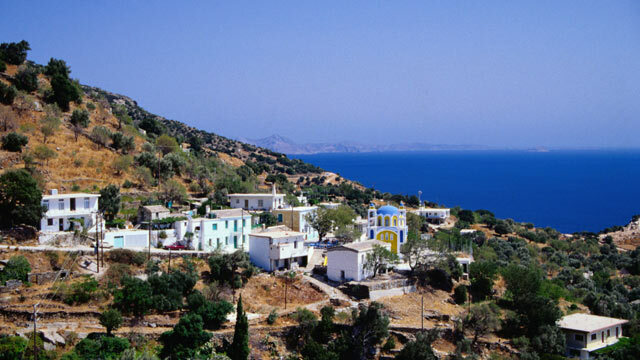 Researchers have been interested in Ikaria since it is one of the "Blue Zones" where people live well past 90 at a significantly higher rate than the rest of the world and up to three times the rate of Americans. But a strong cup of Greek coffee is just one small component of daily life on this island. A 2011 study published in Cardiology Research and Practice found the island population's longevity could also be related to consistent physical activity, a healthy diet and taking a daily midday nap, which can help diffuse stress. Dan Buettner, author of "The Blue Zones," worked with longevity researchers to study the habits of elderly Ikaria residents and says that part of the Ikarian's secret to a long healthy life is as much about how they drink their coffee as the amount. Buettner says Ikaria residents usually enjoy their coffee in a social setting after a midday nap and rarely rush to finish their coffee. "They also have social interaction their whole life. If you're alone it's a known killer," said Buettner. "So drink your coffee with a friend." Dr. Christina Chrysohoou, one of the authors of the study in Vascular Medicine, said the researchers plan to continue their work by investigating how meteorological conditions, minerals in the water and radioactivity could be affecting the age and health of the residents. The" Blue Zone" term came from census maps that Buettner and other researchers would mark with blue pen to find centenarians. As they found them, they began to realize they were congregating in clusters or "Blue Zones," each cluster in exceedingly different regions of the world. In addition to Ikaria they found clusters in Corsica, Costa Rica, southern California and Japan. Buettner says there is no one single dietary element or exercise that is common in these locations that can provide the key to a long life. While Greek coffee is a favorite in Ikaria, it's not exactly prevalent in Okinawa, Japan, which is famous for having a large number of centenarians. "The problem is we keep looking for is a silver bullet," said Buettner. "The answer is a silver buckshot." In Okinawa there are approximately 50 centenarians for every 100,000 residents, while in America there are only 10 to 20 centenarians for every 100,000 people. Researchers working on the Okinawa Centenarian Study have studied 900 centenarians for years to understand why Okinawa residents statistically have longer and healthier lives, even compared to other Japanese residents. Similar to Ikaria, there is no one reason. Okinawans tend to lead active lives with a diet high in vegetables and soy products. They also rarely overeat as they practice "hara hachi bu" or only eating until they are 80 percent full. They also have a sense of purpose called "ikigai," that Buettner describes in "The Blue Zone" as a reason to get out of bed in the morning. Researchers have studied if "ikigai" can affect health and a 2008 study found that simply having this sense of purpose could help lower a person's mortality risk. America has its own "Blue Zone" in the small town of Loma Linda, Calif., outside of Los Angeles. With a population of approximately 23,600, Loma Linda is home to the largest population of Seventh Day Adventists in the U.S. People who are Seventh Day Adventists also happen to be some of the healthiest Americans. In 1958 researchers realized the town had a significantly lower mortality rate than other areas and started to investigate why. In subsequent studies researchers from Loma Linda University found that Seventh Day Adventists tend to live four to seven years longer than their non-Adventist counterparts. Annie Bennet, a researcher on a current study looking at the health of Seventh Day Adventists nationwide says there is no trick to leading a healthy life. "Seventh day Adventists live a healthy life style," said Bennet. "They don't drink alcohol. They don't smoke, and to a large extent abstain from eating meat." The Seventh Day Adventists also eat whole grains, fruit, nuts, vegetables and abstain from caffeine and foods high in saturated fat. Additionally they remain focused on the religious community and reserve Saturday as a day of rest to be spent with family. Last year, according to the San Bernadino County Sun, the Loma Linda Chamber of Commerce honored nine new centenarians last fall with a "Seniors in the Blue Zone" themed parade. Mario Garrett, a professor of gerontology at San Diego State University, says there is one common thread among these locations in that they all offer a sense of community and belonging. "That's why they're living longer as a cluster," said Garrett. "If there was no social [environment] we would find is [centenarians] scattered across the world." Garrett says one additional key element is that the elderly are not excluded from activities. "In most other societies, we find once you reach a certain age people discount you," said Garrett. "Even in Corsica [where people are not outgoing] they belong to each other. That promotes the longevity." Buettner, who has taken lessons he learned in various "Blue Zones" and attempted to implement them in different U.S. cities through his Blue Zone company, says there is no one thing people can do to replicate the health of Blue Zone residents. Instead people can do lots of little things which can add up to a longer and healthier life. However, Buettner says there is one trait that people over 100 tend to share: they're usually pretty agreeable. "Every main principle investigator [of a centenarian study] will say it's hard to measure likability, but the grumps seem to die out," said Buettner.